Animal husbandry without regard to the welfare of animals is today as unthinkable as it is unreasonable. Partly because consumers are increasingly demanding welfare-friendly husbandry conditions, and partly because it is economically advantageous. Only healthy animals will have an optimal performance. Modern feed concepts, for instance the prebiotic acidifier PreAcid, can contribute even without the use of antibiotic growth promoters. Improving and maintaining of gut health is one of the most important goals. The gut is the biggest immune system and plays a crucial part in improving well-being and performance in poultry. The positive effect of butyric acid, either endogenous or supplemented, has been described in detail. However, there is always the question in what form the butyrate should be supplemented. Different forms of butyric acid, either supplemented or endogenous, will have different effects in the animal, dependent on the digestive compartment they reach. Free butyric acid is metabolised at the beginning of the intestinal tract in the acidic environment of the gizzard/proventricle (Denbow and Ichikawa, 2002). The result is a higher concentration of butyric acid in the crop and gizzard, leading to higher proteolytic activity in the proventricle (Moquet et al 2018). In the distal part of the gut, butyric acid will act as a signal for the host animal to strengthen the epithelial barrier, reducing inflammatory processes and simulating the production of antimicrobial peptides (Onrust et al., 2015). To utilise the full beneficial potential of butyric acid, it has to reach colon and the caecum as well as the small intestine. With its unique GlucoFence-complex, PreAcid combines free butyrate with the prebiotic gluconic acid which stimulates the endogenous production of butyric acid in the distal gut compartments – a guaranteed energy source for the epithelial cells in the gut. The results speak for themselves: higher villi and significantly lower crypt depth in jejunum and ileum provide a greater surface area for improved nutrient absorption even compared to antibiotic growth promoters (fig. 1). 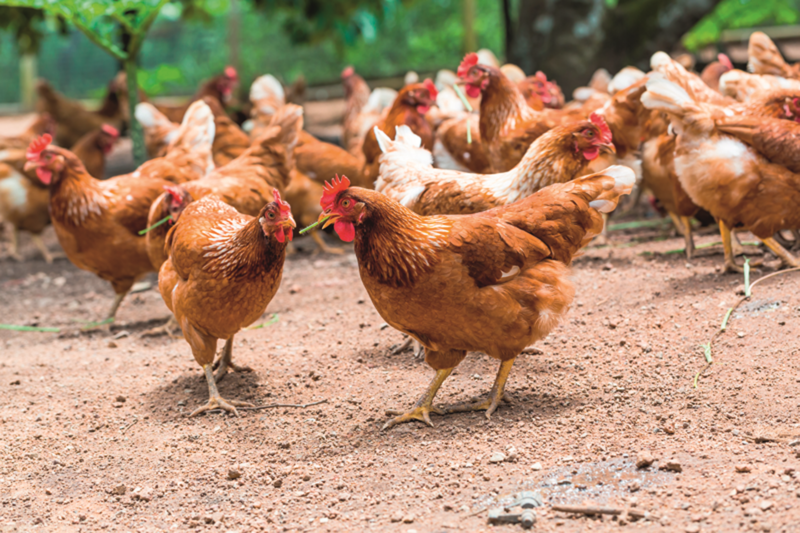 The benefit: PreAcid is the ideal source of butyrate for poultry, proven in a large scale broiler trial conducted on two practical farms with 238,700 broilers in total. The animals were allocated to two groups. The control group received protected butyric acid the treatment group received PreAcid. After eight fattening rounds the result for the PreAcid group was definitive: animals reached higher final weights and a better feed conversion ratio. Mortality was reduced by up to 24 % (fig. 2). 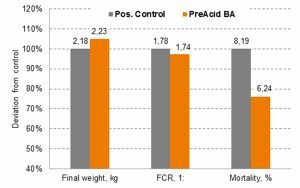 The use of PreAcid reduced feed costs per kg meat by 2.8 % and markedly increased meat yield giving a return on investment of 2.35 compared to the protected butyric acid product. There is an additional positive effect: the markedly reduced odour during processing makes PreAcid easier to handle than butyrates. Sophisticated feed concepts ensure that animals maintain health and optimal performance. This way, PreAcid contributes to animal welfare and at the same time improves profitability of production.